Wintertime icing can affect wind, temperature, and humidity measurements. Ice is removed from sensors on a weekly basis, but the raw data presented here has not been quality controlled. 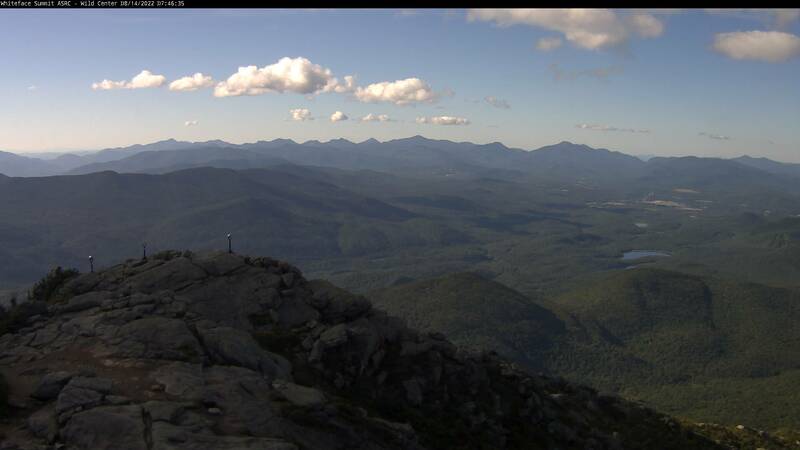 "How New York Lost its Marble"
View Up-To-Date weather data feed from summit of Whiteface Mountain! Perched high atop an iconic summit of the Adirondack Mountains, nestled among the krummholz and alpine tundra, and carved from the granite of the mountain itself, is a historically unique and state-of-the-art scientific research station. Known to locals as the Whiteface Observatory, the Atmospheric Sciences Research Center´s (ASRC) Whiteface Mountain Field Station was established on February 16, 1961 by the State University of New York as a University-wide center to promote and encourage programs in basic and applied sciences related to the atmosphere. Located high in the clouds, the mission of the research at ASRC´s Whiteface Observatory is to enhance our fundamental understanding of the chemical and physical nature of the atmosphere, and to apply that knowledge to study the interaction of chemical, physical, geological, and biological processes impacting our environment. 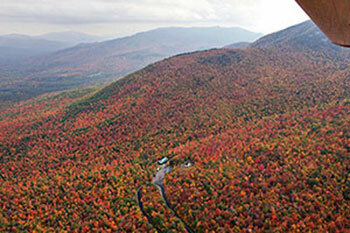 At 1,500 m above sea level, where air masses approaching from the west first encounter the highlands of New York and New England, there is no other site in the Adirondacks that offers researchers the opportunity to directly study these air masses that shape our weather and that transport the pollutants which result in acid rain. 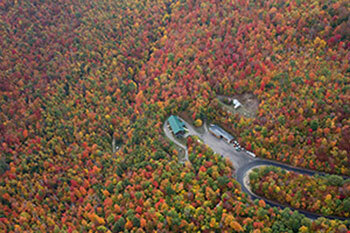 Two scientific research facilities, comprising the Whiteface Mountain Field Station, serve the ASRC in fulfilling its mission. 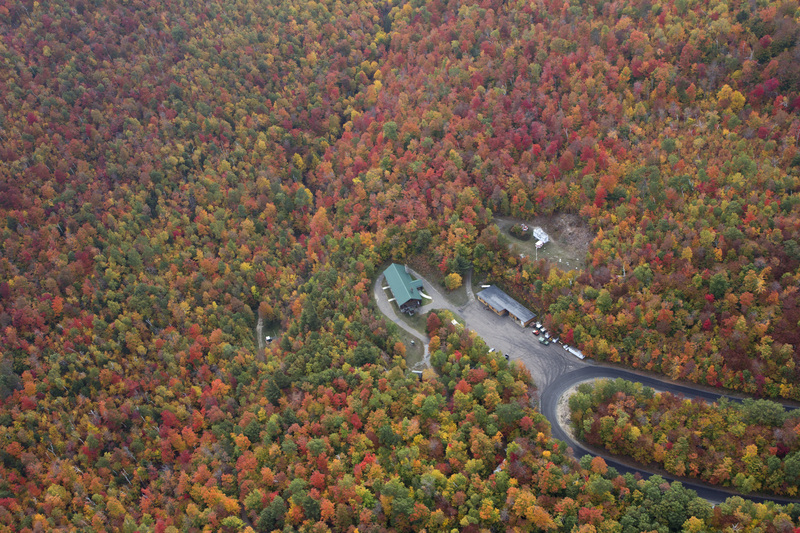 The main facility at the Marble Mountain Lodge (110 Marble Mountain Lane, Town of Wilmington, NY) is perched on the shoulder of the Whiteface massif at an elevation of 604 m. The Lodge has a large lecture hall as well as office and research laboratory space. An annex building houses dry and wet laboratories, offices, and storage facilities for refrigerated and frozen samples. At the Marble Mountain Lodge, ASRC researchers sample the chemical content of the atmosphere, including pollutants and particulates, and continuously monitor weather conditions. Precipitation is also measured as part of the National Atmospheric Deposition Program. In October of 2012, a flow tower and passive Ammonia sampler were added to estimate dry deposition as part of the Environmental Protection Agency´s secondary standard pilot program. Atmospheric trace gases, particulates, and meteorological measurements are made at a monitoring site located 30 m above the lodge. Monitored gases include carbon monoxide (CO), sulfur dioxide (SO2), ozone (O3), and nitrous oxides (NOx). Condensed phase pollutants measured include sulfates and nitrates that result in acid rain, as well as black carbon, which provides a measure of smoke and combustion-related particulates in the air. Overall these measurements at the Lodge, located at a relatively low elevation on the mountainside, represent conditions experienced by most of the ecosystems and communities in the Adirondacks. 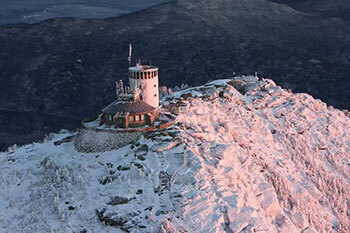 By contrast and by design, the Whiteface Mountain Field Station makes many of the same measurements and weather observations, but is situated at 1,483 m (4867 ft.) in elevation. The silo-shaped observatory is three stories tall and features an observation deck that was recently enclosed as part of a comprehensive renovation project in 2012. The summit and observatory have paved road access to within 92 m of the summit via the Veterans Memorial Highway, AC power, and fiber-optic internet service.